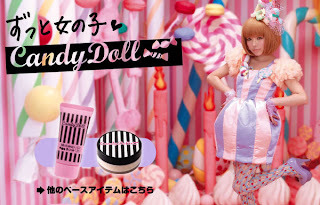 ♥ Sweet Glamour Makeup ♥: BEAUTY CRAVE: CANDY DOLL COSMETICS, JAPAN! BEAUTY CRAVE: CANDY DOLL COSMETICS, JAPAN! Quite some time ago,I had an obsession for Japanese makeup.. They have great products,in adorable packaging. 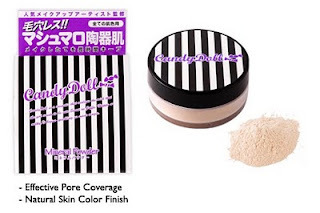 I came across Candy Doll,and it revived my love for Japanese beauty..
Candy Doll Cosmetics is a super cute brand from Japan! Candy Doll is a makeup line produced by Japanese model Tsubasa Masuwaka. Candy Doll is her own personal line. In 2008, she made a tentative step into the makeup market with only two items: a lip concealer and gloss..
Now it features a range of face,lip,and eye products! The packaging is really cute and unique,candy-striped on the containers. I couldn't resist and placed an order on Sasa,luckily they were on sale as well! These products are a bit expensive and hard to come by otherwise. I will do a review once I receive them. Have you tried Candy Doll or Japanese cosmetics?